GENEVA, SWITZERLAND – One Geneva resident was among the 298 people who perished on board the Malaysia Airlines plane that – according to US officials – was brought down by a ground-to-air missile in a disputed region in eastern Ukraine. The Geneva-based World Health Organization’s spokesperson Glenn Thomas was among the victims. The news were also announced on Friday 18 July by the health organization at a bi-weekly press meeting at the UN in Geneva – same place where he regularly met with the UN-based press (see photo below). Thomas, who had previously worked for the BBC, was one of several people flying to a biennial AIDS conference in Australia where the WHO is to release a progress report on HIV treatment. A British national, Thomas had worked for the WHO since 2003, participating regularly at press briefings in Geneva. His death has been felt profoundly in the international community and – of course – at the WHO in particular. 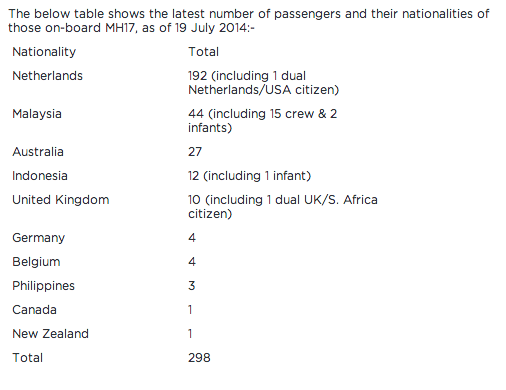 On 19 July Malaysia Airlines published a list of the nationalities of the fatal victims which shows that a large majority were Dutch citizens. The airline said the aircraft had received a “clean bill of health” and had a maintenance check on 11 July.